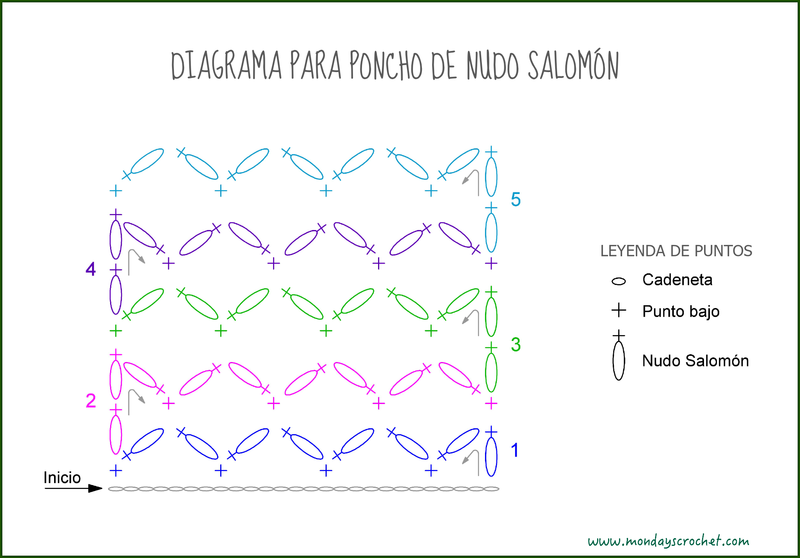 El nudo salomón es una técnica muy apreciada por su rapidez y versatilidad. El resultado es una prenda de gran ligereza. The Solomon knot is a very popular technique because it is fast to produce and it is versatile. The result is an extremely light garment. Tejer una c.a.d. y alargarla hasta poder sujetarla con el dedo pulgar. Apoyar el dedo sobre el hilo y echar hebra. Sacarla por la c.a.d. alargada. Introducir la aguja entre la c.a.d. alargada y la hebra que acabamos de echar. Cerrar estas dos lazadas como si fuera un p.b. Pull loop that is on your hook to the desired length. Try ½ to 1 inch. Yarn over and pull through. This creates an elongated. 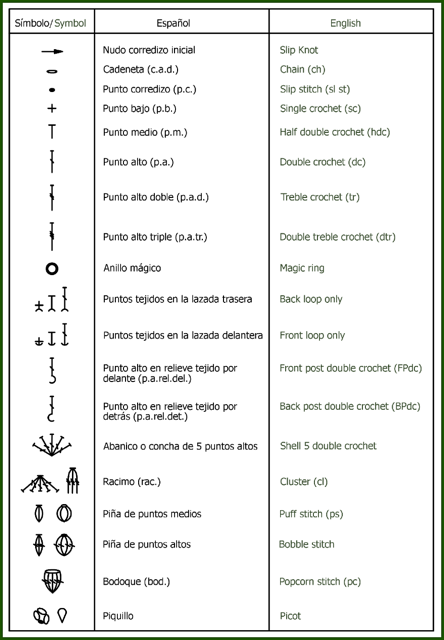 To make rows of knot stitches, you can slip stitch or single crochet in the knots of previous knot stitches. VUELTA INICIAL: Con la aguja número 6 tejer las c.a.d. 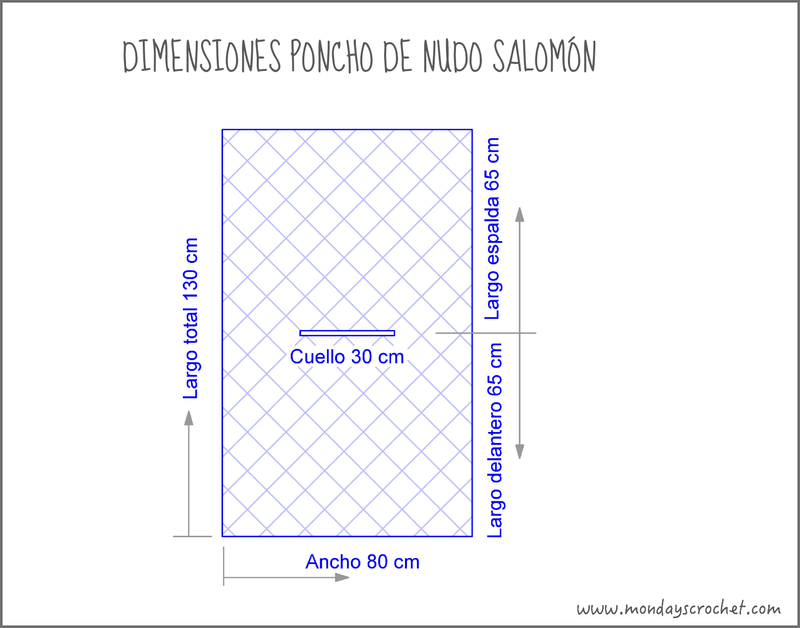 necesarias para obtener una longitud para el ancho del poncho de 80 cm. VUELTA 1.- Cambiar a la aguja número 4,5 y tejer 2 n.S. saltar 3 c.a.d. y unir a la c.a.d. base inicial con 1 p.b. Tejer 2 n.S. saltar 6 c.a.d. y unir a la c.a.d. base inicial con 1 p.b. Repetir hasta completar todas las c.a.d. VUELTA 2.- Tejer 3 n.S. y 1 p.b. entre los dos n.S. del final de la vuelta anterior. Tejer 2 n.S. y 1 p.b. entre los dos siguientes n.S. de la vuelta anterior. Repetir hasta completar toda la longitud. VUELTA 3.- Tejer 3 n.S. y 1 p.b. entre los dos n.S. del final de la vuelta anterior. Tejer 2 n.S. y 1 p.b. entre los dos siguientes n.S. de la vuelta anterior. Repetir hasta completar toda la longitud. Continuar hasta tener una longitud de 65 cm. Tejer 30 cm y unir dos n.S. con 6 c.a.d. hasta completar 30 cm de c.a.d. en la apertura del cuello. Seguir con n.S. el resto del ancho del cuerpo. Tejer igual a la anterior la vuelta del lado del cuello en la espalda; 30 cm n.S., 30 cm de c.a.d. y otros 30 cm de n.S. La siguiente vuelta se tejen los puntos de c.a.d. del cuello cómo en la VUELTA 1. Continuar tejiendo las siguientes vueltas hasta completar 65 cm de longitud en la espalda. 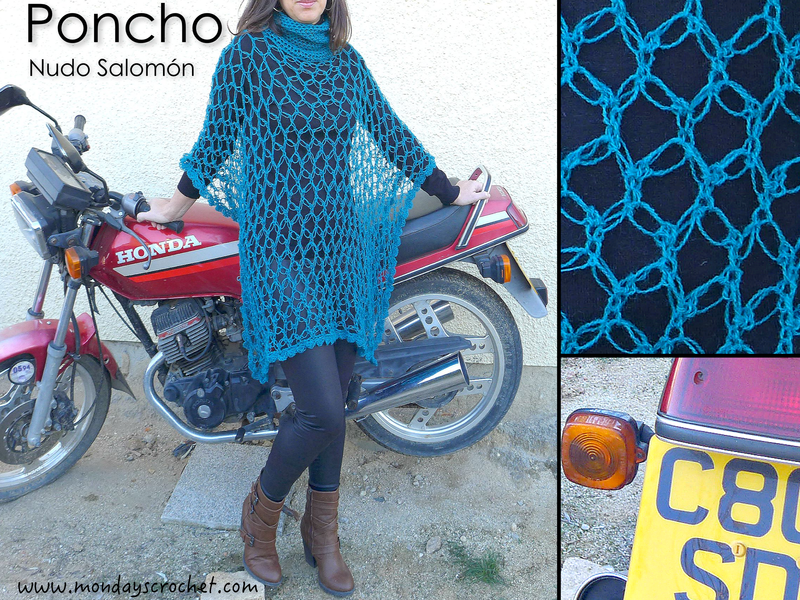 INITIAL ROW: With hook nº 6 make the necessary chains to obtain enough length for the width of the 80 cm poncho. ROW 1.- Chain to hook nº 4,5 and make 2 Solomon knots, skip 3 chains and join to the initial base chain with a sc. Make 2 Solomon knots, skip 6 ch and join to the initial base chain with a sc.. Repeat to complete every chain. ROW 2.- Make 3 Solomon knots and 1 sc between the two Solomon knots at the end of the previous row. Make 2 Solomon knots and 1 sc between the two next Solomon knots of the previous row. Repeat until the length is completed. ROW 3.-Make 3 Solomon knots and 1 sc between the two Solomon knots at the end of the previous row. Make two Solomon knots and 1 sc between the two next Solomon knots of the previous row. Repeat to complete the whole length. Continue until a length of 65 cm is obtained. Make 30 cm and join two Solomon knots with 6 ch until 30 cm of chains is completed in the neck opening. Continue making Solomon knots for the rest of the width of the body. Do the same for the back; 30 cm of Solomon knot, 30 cm of chains and 30 cm of Solomon knot. In the next row make the chain stitches of the neck like in row 1. Keep crocheting until 65 cm of length is completed in the back. El cuello se ha tejido en espiral con p.m. disminuyendo 1 p.m. cada 20 p.m. en las primeras 10 vueltas y 1 p.m. cada 15 p.m. en las siguientes vueltas. Nuestro cuello tiene una longitud de 30 cm. Podéis hacerlo más largo y estrecho, más corto, más ancho o dejar el poncho sin cuello. The neck has been made into a spiral with hdc decreasing 1 hdc every 20 hdc in the first 10 rows and 1 hdc every 15 hdc for the following rows. The neck has a length of 30 cm. You can make it longer, narrower, shorter, wider or leave it without neck. En nuestro poncho tenemos los lados inferiores con cadenetas y los laterales con nudo Salomón. Vamos a rematar ambos lados con punto tulipán. Es un punto muy sencillo formado por racimos de puntos altos. In our poncho, the result is that we have the bottom front and back finished with chains and the sides using Solomon knots. Finish off the whole perimeter using tulip stitch. It is a very simple stitch formed by clusters of dc. En los laterales del poncho hacemos la misma terminación sobre los nudos Salomón. VUELTA 1.- Tejer p.b. en todo el perímetro del poncho y cerrar en el p.b. inicial con 1 p.c. VUELTA 2.- Tejer 3 c.a.d. de subida y 3 p.a. en el mismo p.b. de la vuelta anterior, saltar 2 p.b. 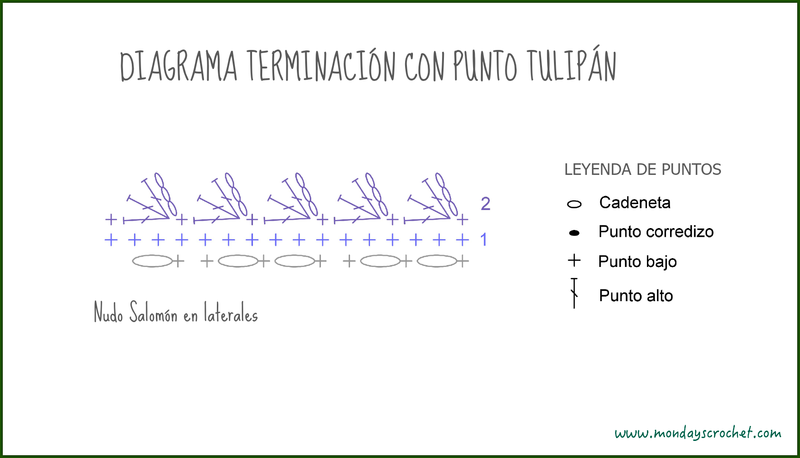 sin tejer y unir el tulipán a la vuelta 1 con 1 p.b. 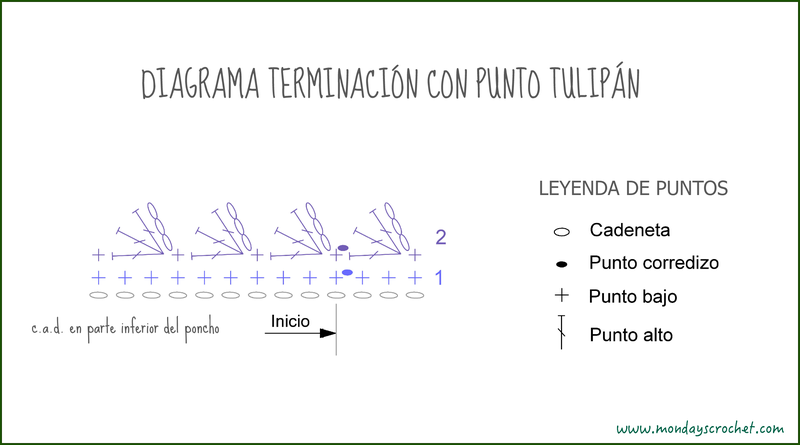 Cerrar al tulipán inicial con 1 p.c. ROW 1. Work sc around the perimeter of the poncho and finish off in the Initial sc with 1 sl st.
ROW 2. Work 3 ch to start the row and 3 dc in the same sc of the previous row, skip 2 sc and join the tulip to row 1 with 1 sc. Finish off the initial tulip with 1 sl st.
Hemos terminado nuestro poncho. ¡Estamos preparadas para el otoño! The poncho is complete and ready por autumn! Gracias Sara! Cuando quieras te enseñamos a hacerlo. Te apetece? guau!! !que atrevido y divertido….pero precioso…chicas!!! Gracias Alicia! En el próximo Encuentro de crochet practicamos este divertido nudo. Lo tenemos que conseguir! Nuestro reto a partir de YA es que tejas algo; sencillo, rápido y que te llene de satisfacción. Nosotras, orgullosísimas!!! !